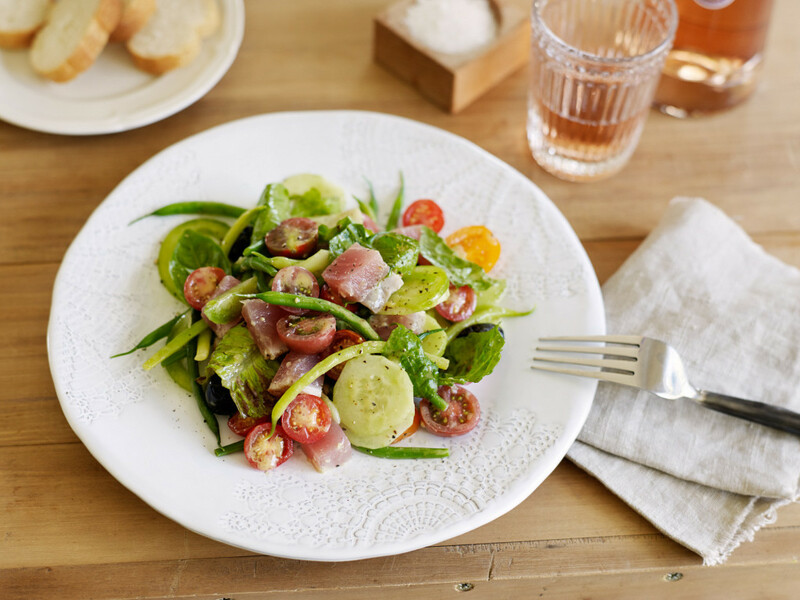 It might sound cliched, but to make this into something that everyone ‘oh’s and ah’s’ over, you need to start with prime ingredients like spanking fresh tuna, sun-ripened tomatoes and crisp cos lettuce (romaine). If the tuna looks dry, don’t buy it, and if the only tomatoes you can get are those tasteless watery jobbies that have been in a cool store, leave them out. This salad should be the essence of summer, simple in it’s execution, each ingredient tasting bright and fresh, and the whole thing so delicious that you might just lick the plate – well, at least scrape over a crust of bread. You need decent olives, the sort that taste of olives, not ‘marinated’ ones – you know the type that have been doctored with spices and chilli so another couple of dollars can be added per jar or ladleful. Splash it all with plenty of pungent olive oil – the fresher the better – and vinegar made from wine, not chemicals. While this is something that’s not always delivered on a plate in Nice, it’s easy enough to do if you take a little care. I’d say the only accompaniments needed are a crusty baguette to mop up all the garlicky juices, and a chilled glass (or three) of Rosé. Oh, and good company. It’s a perfect dish for a summer’s lunch, can’t be beat, I think, but there’s no reason why you can’t share it around a few more and eat it as a small plates sort of thing at an after-work gathering, or shrink the serving number to 4 and serve it for dinner. Just make it. 1 Plunge green beans into a saucepan of gently boiling, salted water and cook uncovered for several minutes until tender – this salad’s not the place for hard, crunchy beans. Drain, rinse with cold water until they feel cool, shake, then dry with paper towels. 2 In a small bowl mix mustard, garlic, vinegar, ½ a teaspoon of salt and black pepper to taste. Whisk in extra virgin olive oil. 3 Put olive oil in a bowl with a good grinding of black pepper, add tuna loin, and turn it to coat in the oil. Heat a small but heavy-based frying pan (skillet) over a medium-high heat for a few minutes. Add a splash of oil, and when it is hot, turn the tuna loin in the peppery oil and transfer to the frying pan. Do not move it: where it lands is where it stays, or you will tear the fibres. Leave it to cook for about a minute (literally,1-1½ minutes), turn carefully with tongs and cook for a further minute. Some pieces of tuna may have a third side, if so, sear that, too; but importantly, do not overcook it. Transfer tuna to a board, season with sea salt and let it rest for 10 minutes. Using a sharp thin-bladed knife, slice into medium-thick rounds. 4 Choose a large serving bowl, preferably not too deep. Put cos lettuce in bowl along with cucumber, tomatoes and green beans. Scatter basil over everything. Rewhisk dressing and pour half of it over the salad ingredients. Give the salad a gentle toss. 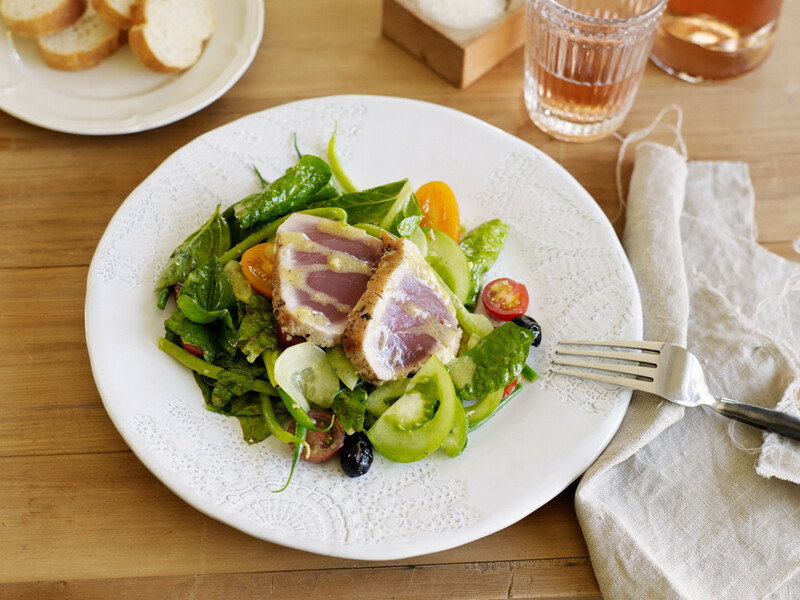 Arrange tuna and olives on top and drizzle tuna with remaining dressing. Serve immediately. Maille creamy Dijonnaise mustard has a nice tang, nothing too ‘bite-y’, and it helps thicken a dressing. It’s milder than most mustards so you can use it generously. If you don’t have it, use a mild mustard of your choice. In place of fresh tuna loin, substitute a large jar (about 440g) of well-drained Spanish or Italian tuna in oil, or use the best quality canned tuna in oil you can find. Sometimes I add green beans, or eggs cooked so that the white is set but the yolks are creamy, and other times cucumber goes in, or canned beans. What makes it work is the freshness and quality of the ingredients, all tossed with a gutsy dressing – get plenty of garlic and mustard in there, and don’t be stingy with the vinegar and salt. I make a winter version, too, with cooked potatoes, canned white beans, bottled tuna and rocket (arugula) which is great for those nights when you want something fast to prepare, and something that is packed with flavour but that doesn’t overload the stomach. Instead of making a platter of salad, arrange and serve on individual plates, or in wide pasta bowls. If preferred, cut the tuna into cubes for serving. Lo ve the sound of this tuna salad – wish it had come up before my birthday yesterday – 5th. April – which Belinda tells me we share. Hope you had as happy a day as I did. We had a jar of your olives last week. They were fantastic. Excited to try these latest salads. Hi Lizzie. Glad you like Shared Kitchen olives. And those salads are just the thing in this weather. The only trick here is to cook the yellow peppers slowly, so they exude sweetness and soften to the same texture as the pasta.